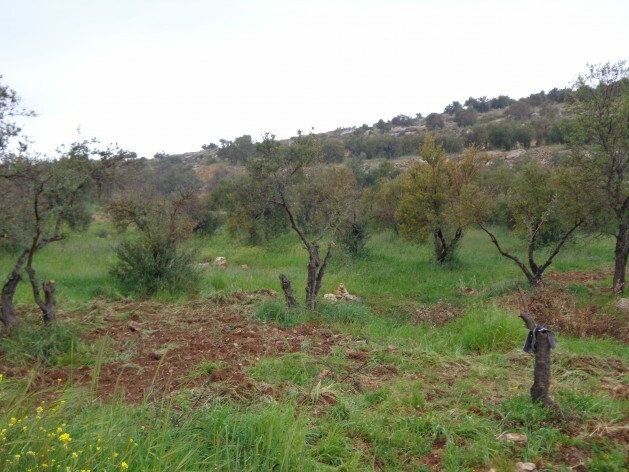 AL SHUYUKH, Southern West Bank (IPS) – “Exactly which olive trees do you want to see? The Israeli settlers have cut down thousands. Can you be more specific?” asked the taxi driver, telling IPS that he wished to remain anonymous. About a week ago, Israeli settlers from the illegal settlement of Mezad, in the southern West Bank near the city of Hebron, cut down approximately 1,200 Palestinian olive trees in an act of environmental terrorism, a vindictive act aimed at intimidating their Palestinian neighbours and economically crippling many Palestinian farmers who rely on harvesting olives to make a living. Israeli settlers are hacking down Palestinian olive trees in an act of environmental terrorism aimed at intimidating their Palestinian neighbours and economically crippling many Palestinian farmers who rely on harvesting olives to make a living. Not only is the harvesting of olives a major part of the Palestinian economy, supporting over 80,000 families, but it is also central to Palestinian culture and lifestyle. Olives and olive oil are regularly served with Palestinian meals. The fruit and its oil have affectionately been called “green gold” by Palestinians, while ancient olive trees are incorporated into Palestinian art including paintings and embroidery. As IPS attempted to take pictures of the remaining carcasses of the 1,200 olive trees hacked down by the settlers, bordering Mezad settlement, Israeli soldiers guarding the site started to approach. We quickly left as the taxi driver, and an elderly Palestinian farmer who had shown us the way, did not want a confrontation. This was the third attack on the olive trees, which belonged to Muhammad al Ayayadah, over a period of several months. Mezad settlement is built on Palestinian land that was confiscated by Israel and the settlers appear to be trying to take over more land for expansion of their settlement. The regular cutting down of olive trees, and the prevention of access to these trees by Israeli security forces, often forces Palestinian farmers off their land as crop losses can cripple them financially. According to the Palestinian Authority (PA) and the Applied Research Institute Jerusalem (ARIJ), approximately 800,000 olive trees have been uprooted since Israel occupied the West Bank and Gaza in 1967. Following the farmers’ eviction, Israel settlers can argue that the land has been abandoned and then move in and take it over with Palestinians having little legal recourse. “No action will be taken against the settlers by the Israeli police. The police will say they are coming to investigate but most times they don’t even show up,” ARIJ spokesman Suhail Khalilieh told IPS. “Even if they do show up, they will say there is no hard evidence that settlers were behind the attack or they will say that the attack was in retaliation for Palestinians throwing stones. “Moreover, most of the settler attacks take place under the guard of the Israeli military who do nothing to stop the vandalism,” added Khalilieh. Israeli settler attacks on Palestinians and their property have also included the burning of homes and cars, the killing of livestock, stone-throwing attacks, running school children over and poisoning water wells. One of the more serious acts of vandalism, in the eyes of a conservative and religious Palestinian society, has been the numerous arson attacks on mosques throughout the West Bank. IPS visited one mosque which had been set on fire by the settlers where the settlers had placed piles of burnt Korans next to the bathroom in a concerted effort to offend. According to the U.N. Office for the Coordination of Humanitarian Affairs (OCHA), 324 incidents of settler violence against Palestinians and their property were reported during 2014 alone. While Palestinian farmers are struggling to survive, a simultaneous development in East Jerusalem has Palestinians concerned. The Israeli authorities plan to build a construction waste site on land in occupied East Jerusalem. The construction of the facility involves further expropriation of privately owned Palestinian land in the Shuafat and Issawiya neighbourhoods of East Jerusalem. Thousands of tonnes of construction waste from all over Jerusalem will be brought in to the site over the next 20 years. The land grab will also see the eviction of Bedouin families living in an encampment between Jerusalem and the Israeli settlement of Ma’aleh Adumim. The area between Jerusalem and Ma’aleh Adumim is a controversial corridor known as E1. Israeli settlement expansion and construction there has caused friction between the U.S. administration and the Israeli government because the West Bank has effectively been cut off from Jerusalem. Legal action taken by a number of Israeli rights groups on behalf of the Palestinians in Israeli civilian courts has so far not helped. “The Israeli courts have not ruled against the construction in the E1 corridor as they have no civil authority over the West Bank which falls under Israeli military jurisdiction and this military rule is behind the continued expansion of the E1 corridor,” Khalilieh told IPS.